Split huge files into smaller files. Merge many small files into fewer larger files. Rearrange logs and data sets to make them easier to work with. Rename, copy, and move files and folders by searching and replacing through file and folder names or paths. Compress and decompress files by moving them in and out of archives. "I think I'm getting to like PowerGREP a lot! Thanx for your support, and more importantly, thanks for creating these wonderful tools, I simply could not do without them!" Apply any number of search terms of regular expressions sequentially or concurrently. Complex search and replace operations often require multiple steps. Use PowerGREP to execute as many steps as you want in a single operation. Run the steps concurrently (search matches won't overlap), or sequentially (replacements cascade onto the following steps). Save all steps into a single PowerGREP Action for instant reuse. Similarly, while searching or collecting data, use a list of search terms or regular expressions to find files matching different criteria, or to extract disparate information from each file. Split files into records before searching. Instead of searching whole files at once, or line by line, split files into whichever record or block structure the files are formatted with. Specify record delimiters, or use regular expressions to match the records themselves. When sectioning files or splitting them into records, you can work with the sections as a whole. Require search matches to span complete sections, collect or replace whole records, or return those records in which the search terms cannot be found. Perform audits and forensic analysis without leaving a trace on the computer you run PowerGREP on. Create a portable installation of PowerGREP onto a USB stick or any other removable device. You can use that portable installation on any PC. PowerGREP will automatically use the USB stick to save its settings, without touching the host computer, unless you explicitly tell PowerGREP to modify or delete certain files. The original grep was a pure command line tool. Modern Windows applications often only provide a point-and-click interface. PowerGREP provides the best of both worlds. All of its features can be used through both its rich graphical user interface (GUI) as well as via the command line. The GUI makes PowerGREP easy-to-use, while the command line allows you to automate or schedule anything. Where most Windows grep tools support only Windows text files, and probably Unicode, PowerGREP supports a wide range of both current and legacy text file encodings: all Windows code pages, various Unicode transformations, all ISO-8859 character sets, most MS-DOS and PC DOS code pages, ECBDIC IBM mainframe code pages, KOI8, etc. 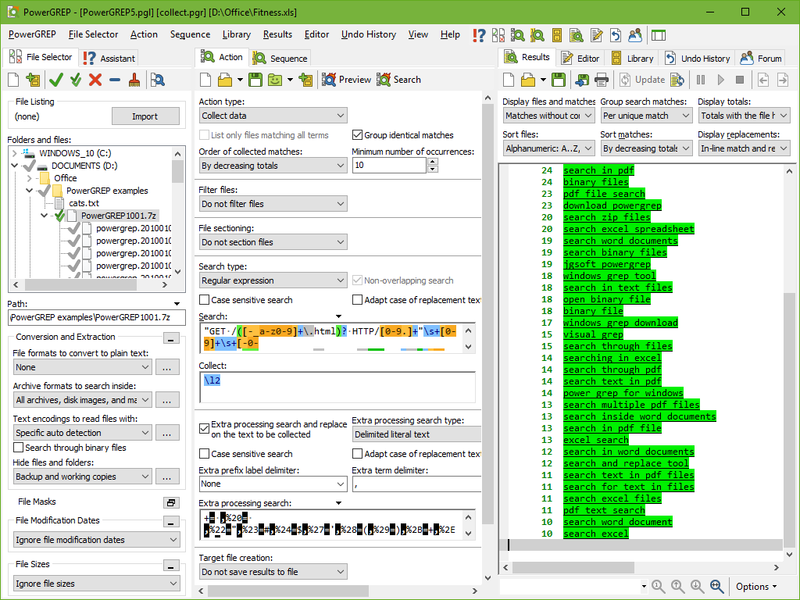 Search through, edit and create text files in any of these encodings. Configure PowerGREP to use specific encodings for certain file types. PowerGREP can also decode a variety of popular proprietary file formats: Microsoft Word documents (.doc and .dot files), Adobe Acrobat documents (.pdf files), Microsoft Excel spreadsheets (.xls files), Lotus 1-2-3 spreadsheets (.wks and .wk1 files) and Quattro Pro spreadsheets (.wq1, .wq2 and .wkq files). Search through these files as if they were plain text files, even if you don't have the original software that created those files. 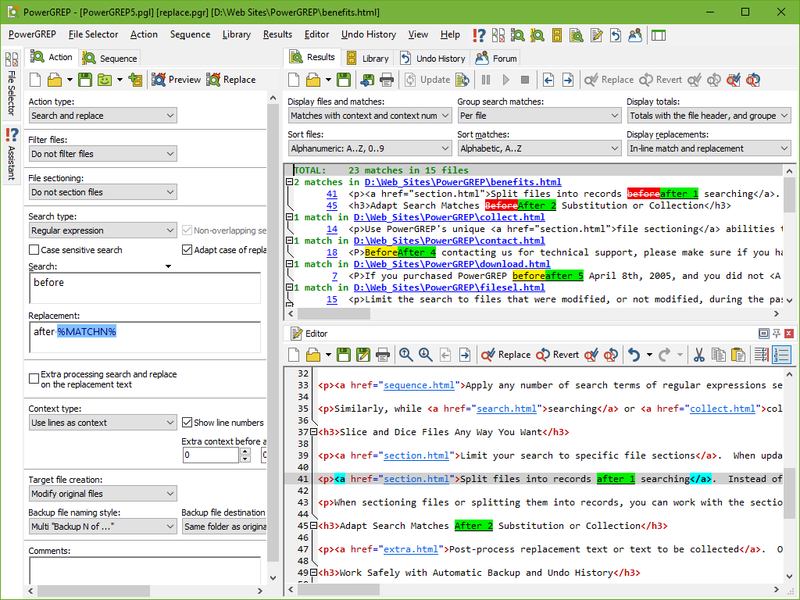 PowerGREP supports the Office Open XML and OpenDocument formats used by Microsoft Office 2007 (and later) and OpenOffice. This includes Word 2007 documents (.docx files), Excel 2007 spreadsheets (.xlsx files), PowerPoint 2007 presentations (.pptx files), and all files saved by the OpenOffice and LibreOffice suites (.odf and other files).